The following descriptions of some of their projects were prepared for the Horizon International Solutions Site by Cook+Fox Architects. Today, the built environment is beginning to reflect a growing awareness of the benefits of a connection to nature. This can partly be attributed to the expanding field of biophilia, which studies the physiological and psychological effects of exposure to nature, and identifies strategies through which we can weave nature into our built environments. Biologist E.O. Wilson described biophilia as humanity’s innate response to nature and connection to natural systems. People viscerally respond to the same relationships in architecture because, simply put, they make us feel good. At its core, biophilia is about environmental response – creating places that respond to and celebrate the natural world, while evoking a positive response from their inhabitants. The Center for Well-Being was built to anchor the campus of the Ross School, a progressive K-12 institution on the East End of Long Island, New York. Merging Eastern and Western philosophies, the building reflects the school’s holistic mission of educating the mind, body, and spirit in order to prepare students to be effective global citizens. 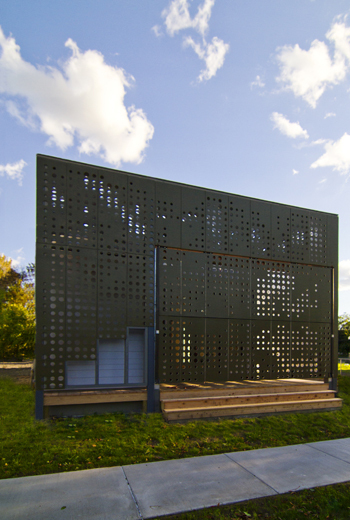 Tucked into a scrub oak forest, the Center is an example of a building that surfaces slowly from the landscape. The three-story building draws on the institution’s innovative “spiral curriculum” in weaving together classrooms, performance and gathering spaces, athletic facilities, and a cafeteria, organized around a spine of locally sourced South Bay quartz. The Center’s central gathering area is the Great Hall, a soaring, open space that hosts concerts and assemblies, and serves as a gathering spot for the community. Inspired by the story of Jonah’s exile in the belly of a great whale, with its themes of transformation, the Great Hall also alludes to local whaling and boat-building history with the exposed “ribs” of its large ceiling beams. One level above, the stone tower houses a wood-fired oven, where bread is baked daily at the organic cafeteria. The tower’s lowest level centers on a pebble-lined pool rippled by a school of koi. In addition to visual and spatial aesthetics, tactile, acoustic, and other sensory consideration shaped the design of the Center for Well-Being. On entering, students remove their shoes, and through stocking feet feel the changing textures of bamboo, stone, and tatami. Like a complex fabric, natural materials and patterns of light weave together in a way that sharpens and elevates the visitor’s awareness of space. Special acoustical challenges of the multi-functional center – including a playing court with meditation alcoves directly below – were addressed with a custom-designed ceiling and extensive vibration insulation between floors. Housing both athletic and performance spaces and more informal social areas, the building is a place for training, connection, and transformation. Behind the scenes, a geothermal heat exchange system uses the constant temperature of an underground aquifer as an energy-efficient means of conditioning the building. The essential elements of fire, water, and earth permeate the Center and instill a sense of being present within the ever-changing landscape. 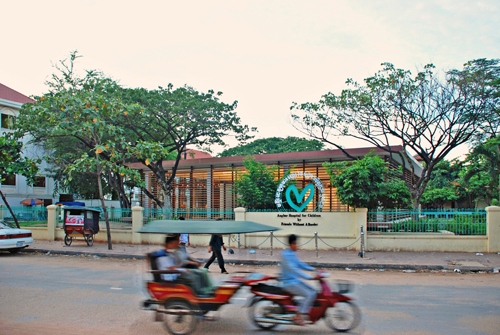 Located on the campus of the Angkor Hospital for Children (AHC) in Siem Reap, Cambodia, the Friends Center serves as both a visitor outreach pavilion and a gallery for exhibiting works of art. The guiding force behind its design was the need to provide a welcoming space where visitors could experience the work of AHC without breaching the privacy of the medical facility. The solution is a layered, transparent structure that mediates visitors’ experience of the hospital, drawing on elements of Cambodia’s rich heritage while expressing a modern ethic of cultural, economic, and environmental sustainability. Functionally and symbolically, water lies at the heart of the new building, where an inverted roof channels rainwater to a central reservoir, open to the sky through a square aperture. In addition to water collection, the project integrated many environmentally responsible strategies. Its construction employed local laborers and artisans. The Center is a tranquil, reflective space to focus on the health and well-being of Cambodia’s next generation. Thinking holistically about children’s health and Cambodia’s environment, the project team helped to found an alternative-fuels pilot project at Angkor Hospital for Children called Naga Biofuels. Since September 2009, the hospital has been running all of its vehicle fleet and generators on 100% biodiesel (B-100) refined from waste vegetable oil. Based on the success of the hospital’s pilot project, Naga Biofuels now provides fuel to a consortium of businesses and non-profits throughout Cambodia. Winner of the “From the Ground Up” competition, Live Work Home considers the longevity and livelihood of the Near West Side of Syracuse, a shrinking city affected by the migration of industry. Affordable housing alone does not respond to the neighborhood’s needs; its vitality as a community is a question of sustaining density, community and diversity. Following the deconstruction of the original home sitting on the lot as well as a nearby warehouse, old-growth pine and hemlock were salvaged and repurposed into the floors and cabinets, part of a broader ethic of waste-free modeling and re-use for the home. To address stormwater issues, the functional landscape design includes low-maintenance, drought-tolerant native grasses and rain-barrels. A planted screen wall helps temper northwest winds, while native plants used throughout attract indigenous wildlife species. Using low-tech, passive strategies to reinforce sustainability and affordability, Live Work Home functions as a modern response to Syracuse’s concerns as a post-industrial American city. The LEED-CI Platinum certified office space at 641 Avenue of the Americas is a light-filled studio and showcase for sustainable design. Located in the penthouse of a former department store in the Ladies’ Mile Historic District, the space features an open floor plan, 14-foot ceilings, and original details from its past as a circa-1902 dining room. 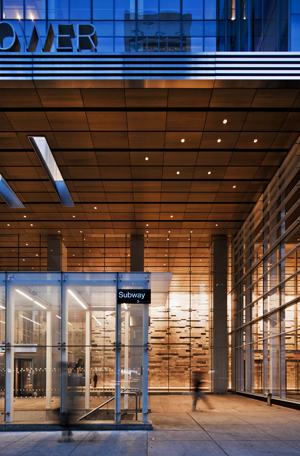 Daylight fills the interior from several directions, with expansive stretches of the Manhattan skyline on view beyond the roof of the building, with daylight dimmers modulating supplemental lighting. A defining feature of the new office and a strong biophilic element is a 3600 square foot roof, a restorative green plane visible from nearly every workplace, planted with drought-tolerant, low-maintenance sedum species with a flexible, nylon module system called Green Paks. The green roof reduces stormwater runoff, decreases the building’s cooling load, and fights the heat island effect that burdens the city’s energy infrastructure. Like a living, green horizon, the roof breaks up the city’s vertical mass and the man-made landscape of cars and concrete buildings. Its presence invites observation and has a way of engaging the office with the outside world. In August 2006, 25 Cook+Fox volunteers hand-laid over 800 Green Paks, while another team of volunteers prepared the plants and gently dug them into the shale-and-soil aggregate, placing six seedlings per bag. Cook+Fox collaborated with the non-profit Gaia Institute to study water retention and growth rates of the sedums chosen for the roof. The Gaia Institute also set up an experimental zone to test the success of various soil aggregate compositions, including Gaia Soil™, a proprietary, ultra-lightweight blend of compost and post-consumer expanded polystyrene foam. The first LEED Platinum certified project in New York, the office incorporates integrative design to produce a healthy, productive work environment. An upgraded HVAC (heating, ventilation, and air conditioning) system, operable windows and low-VOC materials join to provide natural ventilation and protect indoor air quality year-round. Advanced water-saving features, including waterless urinals, dual-flush toilets, and sensor-activated lavatory faucets, reduce water consumption by over 40%. The interior design palette was selected for everyday durability, with priority given to natural materials—these selections act as a “learning lab” for a range of local, eco-friendly materials. 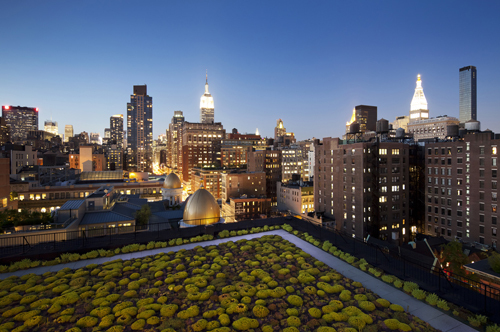 The office is actively used to advocate for the long-term sustainability goals of Mayor Bloomberg’s PlaNYC by promoting the benefits of green roofs in New York City. It has also served as the backdrop for the Mayor’s re-election campaign. 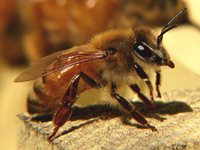 Italian bee: Photograph courtesy of WikipediaIn an effort to further participate in themes of urban sustainability, Cook+Fox has recently installed a beehive and 12,000 Italian bees on the roof to increase pollination for our rooftop garden and the crops growing in the raised-bed planters. Cook+Fox also facilitates regular tours of the office and hosts a monthly environmental lecture series featuring internationally distinguished scientists, authors, and filmmakers. In a district where the commercial palaces of past generations mingle with the creative industries of today, this office space represents a new kind of professional workplace for a sustainable, urban future. Designed to set a new standard in high-performance buildings, for the office workers who occupy the tower and for a nation awakening to the modern imperative of sustainability, the Bank of America Tower at One Bryant Park is a 55-story, 2.2 million square feet project that is the first commercial high-rise to achieve LEED Platinum certification, the highest rating available from the US Green Building Council. Drawing on concepts of biophilia, the vision was to create the highest quality modern workplace by emphasizing daylight, fresh air, and an intrinsic connection to the outdoors. The building’s floor-to-ceiling glass curtain wall minimizes solar heat gain through low-e glass and heat-reflecting ceramic frit while simultaneously providing exquisite views. Waterless urinals, greywater recycling, and rainwater harvesting systems save millions of gallons of potable water and reduce the building’s water consumption by nearly 50%. With an under-floor air system and 95% filtration, fresh air delivered to offices can be individually controlled and is actually cleaner when it is exhausted from the building. Recognizing the building’s impact in the heart of a dense metropolis, thermal ice-storage tanks in the building’s cellar produce ice at night, reducing the building’s peak demand on the city’s over-taxed electric grid. In addition, an onsite 4.6 megawatt cogeneration plant provides a clean, efficient power source for nearly 70% of the building’s annual energy requirements utilizing natural gas to help provide for the buildings electrical needs along with providing steam that heats the building in the winter and runs a smaller absorption chiller during the summer. The Bank of America Tower at One Bryant Park, New York, NY: Photograph ©Cook+Fox ArchitectsIn response to its dense urban context, the building challenges the boundaries of public and private space with the inclusion of 300% more public space than required by zoning law* and a highly transparent corner entry and the Urban Garden Room--a restorative, public space, and a visual response to neighboring Bryant Park. Furthermore, the design incorporates a new subway entrance which links over 10 subway lines through a below-grade passageway to Times Square. Because these transit links allow efficient, low-impact commuting, 2.2 million square feet of real estate was developed without a single parking space on site. 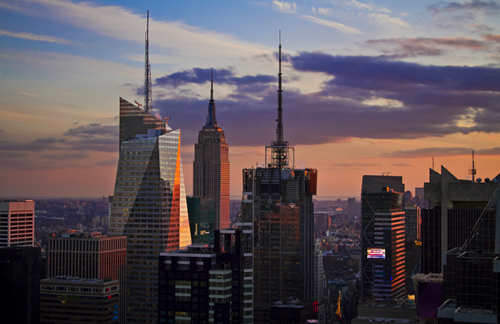 In their namesake tower, the Bank of America occupies six high-tech trading floors and 75% of the interior. The design of these spaces has helped bring about a significant shift in the corporate real estate industry by acknowledging the higher value of a healthy, productive workplace for the thousands of employees who would spend their days in the building. The Bank of America Tower at One Bryant Park, New York, NY: Photograph ©Cook+Fox ArchitectsTo begin with, all energy saving features in the building combined would reduce the annual energy costs by 50%, which totals over $3 million dollars of savings per year for tenants. As importantly, just a 1% rise in worker productivity due to the improved working conditions and indoor environmental quality is anticipated to achieve $10 million per year in savings. Terrapin Bright Green is currently engaged in a five-year productivity study designed to research how the presence of prominent biophilic design features in One Bryant Park has resulted in more effective work processes and signihficantly improved worker outcomes than in existing traditional buildings lacking such features. 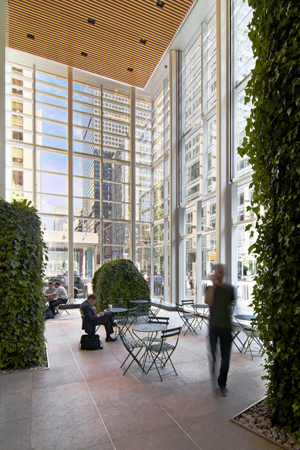 One Bryant Park represents a shift in thinking about modern building design, achieving at scale many of the green building movement’s most transformative ideas for water and energy conservation, material efficiency, and indoor environmental quality. It has fundamentally transformed the market for large-scale commercial developments. In the city defined by the modern skyscraper, the tower also makes a highly visible statement on regeneration, urban stewardship, and global citizenship for the twenty-first century. For the Riverside Overlook also known as Green Outlook, Cook+Fox Architects performed a feasibility study for the Riverside Park Fund (RPF) and the Riverside Clay Tennis Association (RCTA). The Riverside Park Fund and the Riverside Clay Tennis Association are launching a $6 million capital campaign to transform an abandoned parking lot south of the 96th Street Red Clay Tennis Courts into a landscaped Hudson River overlook with a wildflower meadow, a sustainable park maintenance building, and a carbon neutral public restroom, using compost toilet technologies, green roofs, solar energy, rainwater collection, and recycled materials. Originally conceived by Frederick Law Olmstead in 1875, Riverside Park extends along four miles of Manhattan’s shoreline. Part of Robert Moses’ larger West Side Improvement Initiative, the Park and the Henry Hudson Parkway permanently shaped the waterfront’s character. For over 25 years, The RCTA has maintained the ten world-class clay tennis courts near 96th Street in Riverside Park, its members transforming the courts largely through volunteer work and fundraising. Cook+Fox Architects performed a feasibility study for a precedent-setting, sustainable complex that addresses the environmental, practical and cultural needs of both the RCTA and surrounding area with an aim of restoring the natural health of the site. The project aims to achieve net-zero impact, prioritizing environmental stewardship and aesthetic beauty, while keeping the original, transit-oriented park in mind. A planned wildflower meadow will incorporate a rain garden, functioning as a stormwater management tool, and a bed for soil produced by installed composting toilets—this advanced technology would minimize the need for off-site waste disposal. Branched sculptures, incorporating photovoltaic systems, will be scattered through the meadow, and an existing parking lot on the south side will be converted into a storage site. The re-appropriation of this portion of the site offers an opportunity for restorative, native landscaping and will also be a beautiful rest stop for bikers, runners, strollers, and neighbors. Serving as a model for future park improvements, Green Outlook is designed beyond LEED requirements and in accordance with the Living Building Challenge, and when completed, will be the most sustainable building in New York City. 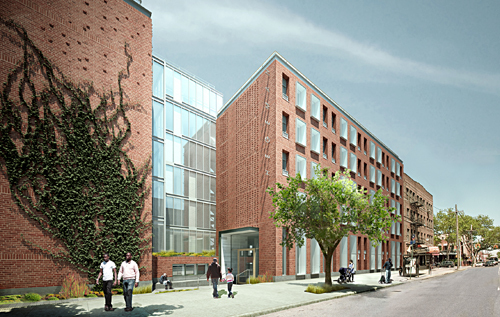 Cook+Fox, architects for the Hegeman project, have just completed the project with the Common Ground organization in Brownsville, Brooklyn, New York. The Hegeman Residence is a residential community providing supportive housing and on-site services for low-income and formerly homeless individuals. One of the first projects developed under Common Ground Community’s Green Campaign, the development emphasizes good health and indoor air quality, restorative and biophilic design, and best practices to save tenants money on energy bills. Views to green space and natural daylight are prioritized, even in below-grade office spaces. An inner courtyard provides protected green space with room for urban agriculture; a gently winding, paved path makes the courtyard accessible to residents of all ages and physical abilities. Overhead, 3,400 square feet of greenery on the roof cool the building and slows stormwater run-off from the site. 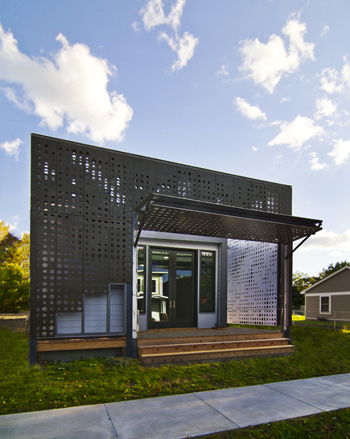 Individual units are finished with durable, non-toxic materials and are designed to save energy and water, helping the building earn its anticipated LEED Silver certification. Addressing the local architectural context as well as its natural environment, the six story building respects the surrounding neighborhood with its restrained planning, height, and massing. Thoughtful yet economical techniques add depth and articulation to the brick façade, encouraging light and shadows to play over its surface. The building’s single entrance on Hegeman Avenue is both welcoming and secure, with large windows in the entry lobby allowing visual connections to the street and the interior courtyard. By encouraging restorative connections to nature as well as a sense of shelter and refuge, the building will provide a comfortable, high quality living environment for residents. * The zoning law stipulated that 5,406 square feet (sf) of pedestrian circulation space be provided. Cook+Fox provided 14,519sf through a combination of sidewalk widening along 42nd and 43rd streets, a through-block connection, relocation of the subway stair and the corner recess and arcade. This article was prepared for the Horizon International Solutions Site by Cook+Fox Architects, 9 May 2012. LEED, Leadership in Energy and Environmental Design, is "... redefining the way we think about the places where we live, work and learn. As an internationally recognized mark of excellence, LEED provides building owners and operators with a framework for identifying and implementing practical and measurable green building design, construction, operations and maintenance solutions."